One student from each local school was honored recently at the annual Most Inspiring Students Awards dinner. The winning students were recognized for overcoming formidable obstacles and for setting examples for their peers by coming to school on time, getting their homework done and facing their challenges head on. The keynote speaker was pioneering basketball coach George Raveling, who will be inducted into the Naismith Memorial Basketball Hall of Fame in September. He delivered a speech entitled “Dream Makers,” encouraging students to dream and strive for excellence. Also speaking at the event were former LBUSD Board of Education President Bobbie Smith and former Long Beach Mayor Beverly O'Neill. Earning the Superintendent’s Community Service Award at the annual dinner were Matthew and Roberta Jenkins, who were recognized for exemplary support of K-12 and higher education. The annual event is sponsored by the Long Beach Education Foundation. The Foundation’s Mike Murray and KNX1070 News Anchor Frank Mottek served as masters of ceremony. Entertainment was provided by Denean Dyson and the Soul Foundation. INSPIRING STUDENT – Cabrillo High School student Anthony Moguel was one of the honorees at the recent Most Inspiring Students Awards. 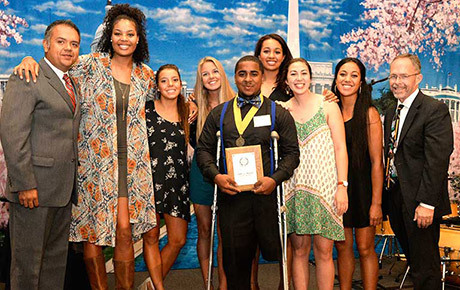 Joining him were members of the Cal State Long Beach women's volleyball team, who helped to present the awards. The larger photo also shows Cabrillo Co-Principal Alejandro Vega, left, and LBUSD Superintendent Christopher J. Steinhauser, right.